It’s been quiet today. I lounged around my apartment, reading comics, catching up with TV shows and friends, making art and banana bread, high on the absence of immediate responsibility. My last grade of the semester came in last night before I went to sleep and it seemed impossible that I had ended what proved to be a tragic semester on such a high note. I will admit, I cried. Not hard or for very long, but I was moved for so many reasons. For once, I got the opportunity to let my work be as limitless as I am. Despite being in grad school, on track for a PhD, I still struggle to reign in my ideas and stuff them in a paper. Someone recognized my knee-jerk impulse to wonder what Booker T. Washington would have thought of hip-hop as insightful and my desire to turn everything into a story virtuous. I felt validated in my knowledge. For once, I eagerly anticipated getting my work back, knowing I’d knocked the assignment out of the park, because I was operating within my wheelhouse, rather than anxiously awaiting results, knowing I’d get pages of what I’d done wrong, what I could’ve done more of or what I could have added. It’s sort of the point of academia, really– you could’ve always done something better and someone is always going to point it out. At some point, you simply have to say, this is the best I can do with the time and resources I was given. You have to cut it off. So when I received my first grade back (which was not at all disappointing considering I’d only been able to go to one class a week all semester, had to rewrite my entire prospectus with an entirely different bibliography and rewrite my paper to include about three more books), I gave in. I made myself be satisfied with my grade. The fact was, given my mental health issues, my medical leave from school, and my mother’s hospitalization and resulting struggles, it was remarkable that I even came back to school. It was extraordinary that I not only went to class but actively participated, and even did my readings. (I was reading painfully slowly and was almost always catching up, but I finished it all, nevertheless.) It was beyond reason that I managed to even finish a final paper, but even rewrite, expand my argument and source base within a few weeks, considering I was still sleeping too much and spending every free evening I had in Suffolk. I did the absolute best that I could have done with that paper. I worked damn hard on it. And it may not have been perfect, but I worked as hard as I could to turn into something good, that I liked. What I wrote would’ve been good anyway, but it was amazing to me, given what it had taken to write it. It was proof to me that grades don’t reflect struggle. They don’t reflect life. No one’s going to know what I had to go through to get that A-, nobody but me. I prayed more than I wrote during my finals weeks. I cried more than I care to admit. I was so determined to finish because I had made it that far, that I just prayed to make it. I prayed for no success other than surviving, and yet I get to sit here and write about what it had taken to get my A-, and about how my A performance in another class was validating and a testament. I don’t normally like to put my grades “out there.” When I was in the ninth grade, my best friend took my test and told the class I’d gotten a 98 on it, so naturally I threw a book at his head. Hard. Thankfully, he ducked. But for some reason I want to put my 3.9 on a certificate, frame it, and hang it above my bed. My earlier blogposts from the beginning of the semester somehow seemed to foreshadow the downward spiral that my spring was going to take. I missed that first step in January, and never recovered. But in spite of the fact that I kept missing steps, and was hurtling downward, I never stopped moved. Moving forward is still forward motion, even if you’re falling. So I stumbled through the semester, just praying to keep moving forward– to not stop, because if I stopped I didn’t know if I’d be able to move again. I constantly tripped over myself, tumbled and rolled, and yet I still managed to win. Now, let me be crystal– I was lucky. I recognize that the “normal” course of action would have been for me to withdraw from the semester. There was simply too much to be getting on with in my life and in my family’s life this semester. There is nothing healthy about the fact that during two nearly fatal circumstances in which my mother and I were physically and mentally drowning, I put my papers on the life raft instead of trying to save her or myself. Nevertheless, I won’t deny that I have been tremendously blessed to have gotten the results that I received. In fact, I have literally running around scream-singing “Somebody say BLESSED! (Blessed! )” since the first grade came in. Amid the insanity, I also found out that I will be serving as the Lemon Project graduate assistant next year, a post that I am truly excited to occupy. Grateful though I am for the skill set I have acquired as a Omohundro apprentice, I have never been more glad to have a job that doesn’t require me to sit in a basement 10 hours a week, staring at a computer screen, only to interact with a human to see if there are leftover snacks in the break room. Just as my performance on my Af-Am texts paper proved, I thrive in environments when I’m given intellectual freedom, a sense of creative liberation and respected as an academic. I prosper when I can break down high brow ideas into digestible meaning. I create. I orchestrate. I lead. I negotiate. I am so much more than a researcher. My intellect is not limited to papers and often is more readily visible when I’m given such outlets as Lemon or a script to really spread my wings. When I let my ideas spread over acres, the result is a diverse, expansive and prosperous garden. Fortunately though, there are still several months between now and when I take up my mantle, and more fortunately still, there is plenty to do until then. I might’ve mentioned, I have a job as a course instructor for the cross cultural program with Keio University for two weeks in August, which will be a 24/7 on call sort of gig. Until then, I’ll work part time at Michaels craft store and write/edit my Masters thesis. 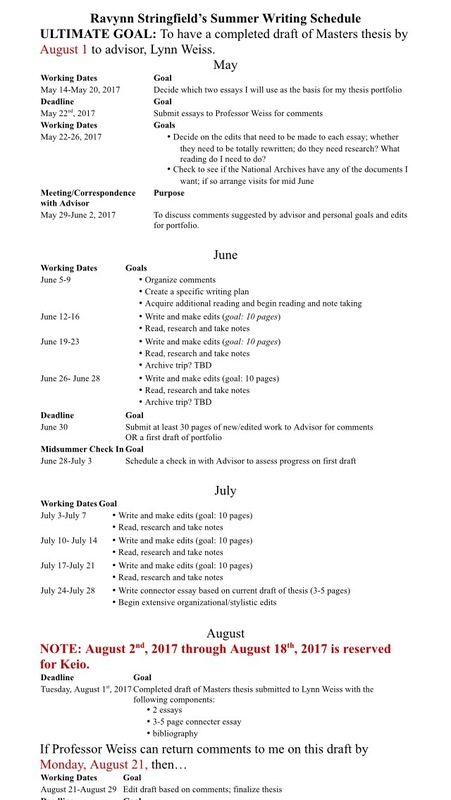 I’m extremely interested in doing an editing internship with the peer review blog Black Perspectives, but I’m still trying to decide what is reasonable, what is too much, and figuring out if I am going to have the time to take care of myself the way I need to and do all of the things I want to do. The truth is that even though I know I can do it, I need to be more attentive to whether I should do things based on me and what I need as a person. Even without Black Perspectives, my summer will still be extremely fulfilling and busy. I even have a writing schedule worked up (per request of the Dean) to keep me honest. Either way, I’m celebrating the monumental success of having survived a hellish semester with much sleeping, lots of food and many comics. Given that I’ve got so much coming down the pipe, I might update the blog more than I thought I would, providing some “intermission” entertainment, giving updates on my thesis progress and so on. So to those who have struggled with me from the beginning, thank you. Just knowing that every now and then somebody reads this, helps me feel a little less alone in this great big lonely world we call Academia. And to those of you just joining me, the good new is there’s still plenty of adventure left.